These Heirloom Vine Silver Invitations with Envelopes make it easy to create professional looking invitations right from your home printer! Invitations measure 5.5" x 7.75" and are made from a 70lb cover stock. The metallic chalice pockets are made from 86lb cover stock. 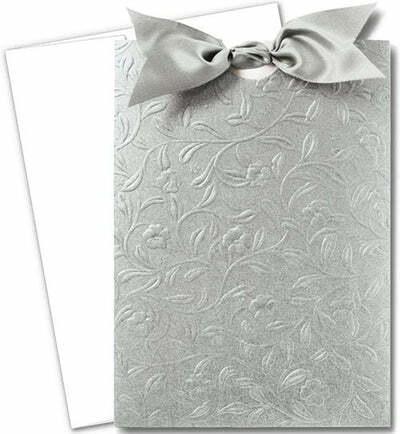 This invitation & note card kit includes 28 invites, 28 envelopes, 28 metallic, embossed chalice pockets, and 15 yards (1.5" wide) shell grey satin ribbon.